I remember as a young child the single fluorescent fixture that hung in the middle of the kitchen in the home I lived. At time this kitchen light was to bright when you were looking for a snack in the middle of the night. When there was cooking or baking to be done in the kitchen it was to din to read the recipes we were trying to use. Kitchen lighting has come a long way since then. In today’s modern kitchen there are several different types of kitchen lighting to help us accomplish what we need in the kitchen. 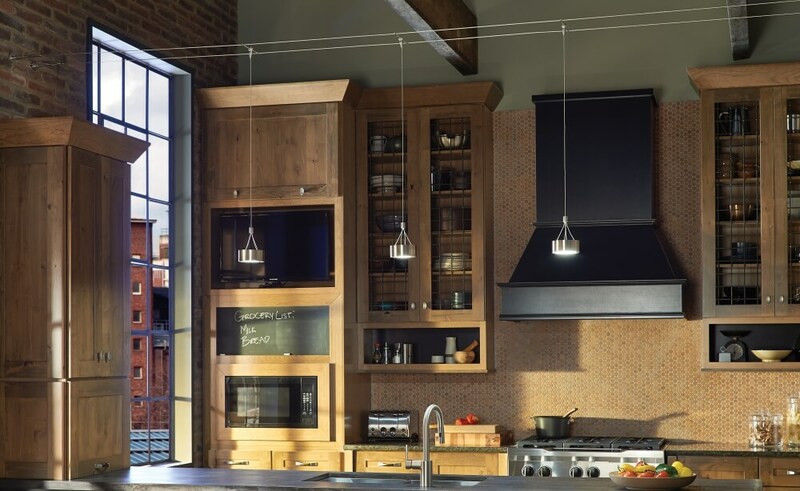 In some of today’s modern kitchens the type of hardware and doors that are being used in the kitchen along with the correct choice of lighting the kitchen becomes a display area and adds a great look of elegance to our homes. We will look at a few popular types of fixtures used in the kitchen and see what they have to offer. This is a great way to offer halogen, fluorescent, and high-low voltage lights that will help you to direct the lighting where you need. There are several different type of track lighting that can be configured in hundreds on different combinations. You can also use the existing electrical box from the light already installed in the kitchen as a starting point. A wide variety of fixtures available for track lighting will help to add to the look you are looking for as well as being placed to highlight the areas you need the light the most. Once you select the fixture you will want to align them in a way as to not cast shadows on the work area where you will be working. A good example of this would be to place a fixture overhead on the left and right side of the sink. In this manner you will not be blocking the light from the work area the way you would if you add a single overhead fixture. You will want to do the same over other work areas such as the cutting area and over the cooktop. Under cabinet lighting will add light where you need it most. In a lot of cabinet configurations, the upper cabinets will block the light from the areas under the top cabinets. This is the area where a lot of the small appliances such as the microwave, coffee pot, and blenders are located. This type of lighting will also help to illuminate cutting boards and cookbooks for easier reading. Under cabinet lights are available in three different bulb varieties. Fluorescent, halogen, and incandescent. Fluorescent lights will cast a cool white glow under the cabinets. These bulbs are available in several different sizes to help accommodate the lengths of your cabinets. Halogen lights are available in strips as well as disk and puck style. These lights will cast a warm glow that is not overpowering but will provide a great light to work with. Halogen lights are almost the same ambient light as sunlight. Surface mount as well as recessed fixture are available for halogen bulbs. Incandescent bulbs are also available in a variety of fixtures that will burn smaller bulbs giving you the light you need without producing too much heat. Whichever type of under counter lighting you choose be sure to mount it to the front of the upper cabinets to light up the work area more. If they are mounted closer to the back the fixtures will light up the wall instead of the needed work area. Most of the recessed lighting you see in the kitchen are standard “can” fixtures with different types of bulbs. These canister lights as they are also known are basically used around the perimeter of a room. They tend to light up walls, floors, and cabinet fronts. The canisters can be installed with different types of lights sockets that can be directed anywhere you need the light. These two types of sockets are known as eyeball and wall washers. You can easily upgrade existing canister lights by switching the trim package. You can utilize the same canister but change the trim package to except the different types of light bulbs that suite you the best. One thing to keep in mind is the fact that the trim packages for canister lights are made to fit the same canisters of the manufacturer. Dimmer switches can be a great addition to any lighting package. There are times when you will not need the kitchen light to be fully bright. If you are cooking, reading recipes, or cutting and chopping you will need the light over your work area. Perhaps you will want to enjoy a nice dinner you can then turn the dimmer down to help create that special atmosphere. A dimmer switch will allow you to have general lighting, task lighting, and accent lighting from the same lights in your kitchen. Dimmer switches will add an extra touch of versatility to your kitchen lighting. We have many more bulb options today than we have had in the past. In the past our main choices of bulbs were incandescent or fluorescent. They were good for lighting but there were a couple of things that were disadvantages of these bulbs. The incandescent bulbs were bright and put off plenty of light but they also but of a lot of heat. Fluorescent lighting gave us a different type of lighting but at times the bulbs took a few minutes to get started. With today’s bulb choices such as CFL’s, LED’s and halogen bulbs we have a brighter and truer colors in light offerings today. Not only do these bulbs offer great lighting they also help us to cut energy cost and save money. Did you know that modern vanity lighting is the new trend? Look around and notice how lights on the walls are filling contemporary spaces. Just take a look at your office and other public areas. If you are observant of the elements around, you will notice how Modern Vanity Lighting is filling all spaces rapidly. They are mostly used on the wall and just for decoration porpoises. A bathroom is a perfect place to add Modern Vanity Lighting. This beautiful sample from Z-Lite is the perfect choice for a small mirror. There is a model with 4 lights if you have a wider space. The best of this sort of lighting for your bathroom’s mirror is that you can combine the same style upside down to give some accents to certain parts of the place. For example, I like to highlight the corners or the sides of the mirror. Dewalt is one of the reputed names in industrial hardware supplies. It delivers the power needed to do extremely tough jobs, even in the condition where there is no power sources. Many DIY profs trust dewalt and due to its immense ability perform the toughest jobs easily. One of the Dewalt's drilling tools, FLEXVOLT cordless tools helps Isak build tough and durable houses in Sweden's rugged backcountry. Flexvot is compatible with DEWALT 20V Max*, and 120V max tools. The batteries of Flexvolt gives you the power of freedom and longevity to perform the job without any interruption. You may want to design your home, but a lack of ideas may spoil your plans. Symmetry is really important as it provides calmness and stability. Create centre focal points where you can hang paintings or your choice of art. Backsplashes behind the cook top can be brought in and use tiles of great quality. Even though your house may have amazing walls and tiles, you can bring the brick back. Use a few spaces and use bricking to add an old world charm yet a modern feel. Ask experts and tell them to use tiles in your house where it looks great. The most important thing you need to remember is to plan your lighting before during initial stages. Consider hanging chandeliers, wall sconces, pedants and different types of lighting depending up on your style and design. Whatever your needs are, when it comes to home ceiling fans and accessories, Emerson has you covered. Emerson fans have a large selection of stunning indoor and outdoor fans, as well as fan blades, accessories, lamp shades, controls, and light kits. You can check out for emerson fans the selection for any replacement or upgraded parts you might want or you can do a total makeover and buy new fan from our line of beautifully crafted options. All of emersons fans are made with quality and valued customers in mind. Look through the options to see all of the various items. To provide you with the perfect option, Emerson fans produce ceiling fans and accessories in many sizes, shapes, and styles. These fans come in designs ranging from traditional to modern, with many in between. You can choose from a number of blades, blade spans, materials, and finishes for a customized experience. Browse the selection of lighted and non-lighted ceiling fans that can be installed in various places. THe outdoor fans are perfect for mudrooms, screened porches, sunrooms, and any outdoor space that could use some help with ventillation and lighting. Shop Emersons indoor fans for fans that can blend in or stand out in any room of the house; great for vaulted ceilings and open entryways ceiling fans are economical and practical. Copyright © 2018 HelloMagz. Simple theme. Theme images by imacon. Powered by Blogger.